I ordered the Brisket Platter. This came with three large slices of brisket, French fries, and a roll. In terms of the sides, the fries were what was expected and the roll was disappointing. It was flavorless mushy white bread and left me with no desire to finish the thing. The brisket was actually very tasty. It was nice and lean, unlike some brisket I've had with turns out to be half fat. It had a nice smokey taste and was coated with a rub which provided an extra burst of flavor around the edges of the meat. 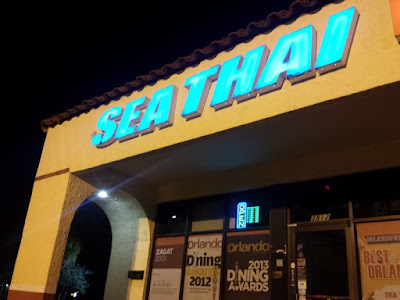 I had dinner at Sea Thai in Orlando. Sea apparently stands for South East Asia rather than anything to do with seafood. I know this restaurant from the countless awards that they won over the years, but this was my first visit to Sea Thai. I ordered the Spicy Basil Duck. This dish was served in a sizzling skillet. 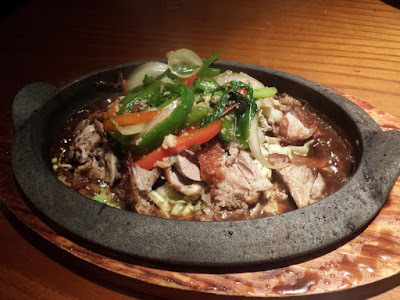 The duck was served with sweet basil, chili, onions, scallions, and bell peppers in a slightly spicy sauce. I enjoyed the crispy skin on the duck. While some of the meat was nice and tender, there were other parts which were tough and chewy. Different parts of the duck perhaps? The sauce was good, although it wasn't as spicy as the menu advertised. My biggest complaint with the dish was that there wasn't enough sauce. Being that the plate was hot and sizzling, most of the liquid in the sauce evaporated. 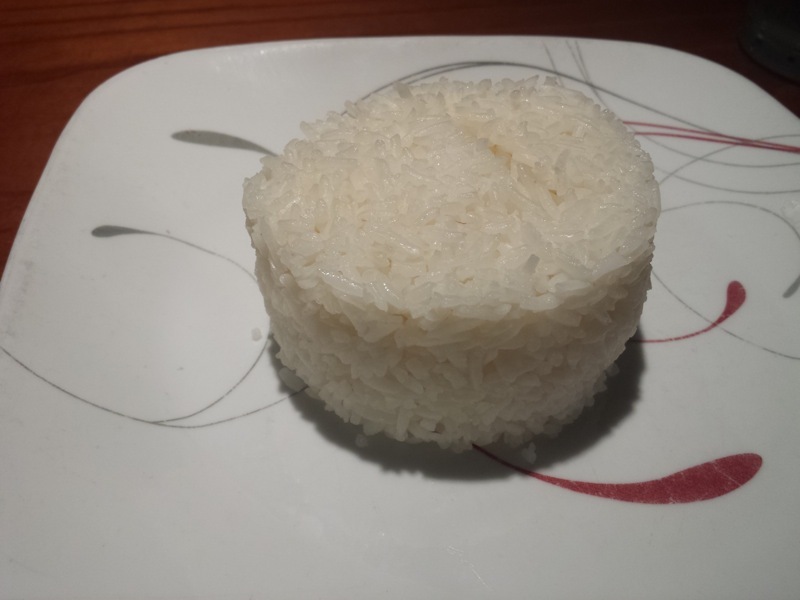 I would have liked to use some of that sauce to flavor the rice that was served on the side. I liked what I tried at Sea Thai. With my one data point of eating here, I don't know if I'd be willing to rate it as the Best of Orlando like all their awards do just yet, but I'd go back! Recently I was invited to enjoy a sampling of the Whole Foods Market holiday menu. The event happened at the Phillips Crossing Whole Foods off Sand Lake Road and what a cornucopia of deliciousness it was! The variety and creativity of the prepared offerings along with menu planning assistance will surely alleviate the stress of any gathering. Bring on the festivities! To begin, I tasted a luscious French blue cheese called Persille du Beaujolais served with a honeycomb to balance the savory notes. I learned that persille means parsleyed in french and just describes the blue green veining throughout blue cheese. The creamery in France overlooks Beaujolais vineyards, but it was truly dreamy when I paired it with a white Vin de Savio Apremont, which is a top 10 holiday wine pick. I also found out that Whole Foods Certified Cheese Professionals can create a cheese and wine pairing menu just for the asking. Cranberry Walnut and Fig Stuffed Brie is a layer cake made of American artisan Brie filled and topped with cranberries and caramelized walnuts and fig spread. It was a beautiful presentation available in a small or large stack. Next I tried the St James Smoked Salmon platter. Scottish salmon cold smoked with oak, with no nitrates or preservatives, only a buttery silkiness served with hot house cucumbers, red onions, capers, and sliced eggs, David, the Regional Seafood Coordinator mentioned that St James has a smokehouse in Miami-- nice to support local-- and that the salmon are fed a high quality diet, that I found palpable in the flavor. In addition, the company prides themselves on sustainability. The Sasasian Caviar served on bite sized blini with creme fraiche was outstanding. There were three types offered: Truffle Pearls,Trout, and Imperial and I liked them all! The pop of the lightly salted glistening eggs was a tantalizing treat for all the senses. Of course there was moist roasted turkey and an array of accompaniments and options. Here's the Bell and Evans smoked Cornish hens. One of my favorite sides were the harvest root vegetables, kale, tender brussels sprouts, and butternut squash with candied pecans and cranberries dusted with cinnamon. There's also a hearty Vegan Field Roast En Croute as a meat alternative. Grains are used as a vegetarian protein combined with squash, mushrooms, apples and spices wrapped in an outer layer. It is a great alternative to soy based proteins. Pumpkin Cheesecake was creamy, without being too heavy, and had perfect undertones of cinnamon, nutmeg, cloves and of course pumpkin. It is a creative twist on the traditional pumpkin pie. Fruit Cake also was sampled and it was nothing like the much maligned variety. It was very moist, tender, and dark with the sumptuous, soft fruits used mainly as a topping. This Fruit Cake would definitely be consumed immediately and certainly not re-gifted! 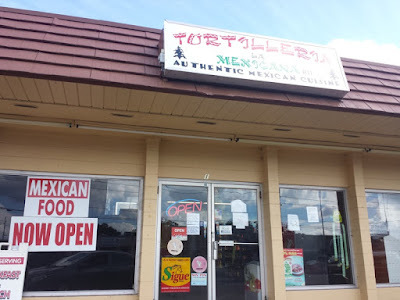 I had lunch one afternoon from Tortilleria La Mexicana #11 in Longwood. They are located in a small strip mall near the intersection of 434 and 427. The restaurant is attached to a convenience store, selling various products. The Mexican convenience store has been in this location for as long as I remember, but the food is a relatively new addition. I'm assuming by the #11 that this is part of a Tortilleria La Mexicana chain. I ordered three tacos. I tried the Pollo, Chorizo, and Al Pastor. Each taco was served in a corn tortilla. These were interesting. They weren't completely soft, but they didn't have the consistency of hard shelled fried tortillas either. They were still soft and pliable, but had a bit more character. I am guessing the tortillas were pan fried. 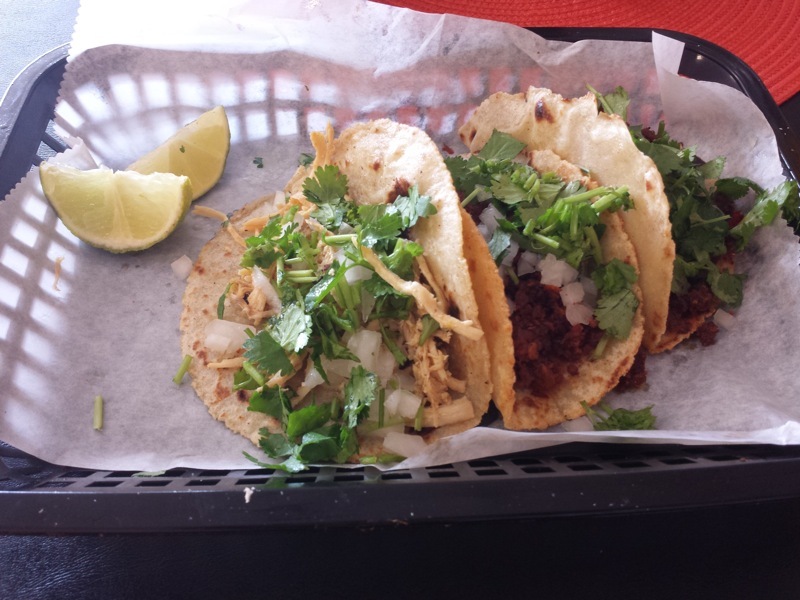 Each of the tacos was topped with onions and cilantro, with lime slices to squeeze over top and salsas on the side. As for the meats, the pollo was a little plain. The chicken was shredded into fine strips and was good enough. Similar to my experience at El Taco Amigo in Deland, I was unable to tell which meat was the al pastor and which was chorizo. Both were good, but in terms of taste, texture, and appearance, both meats were very similar. 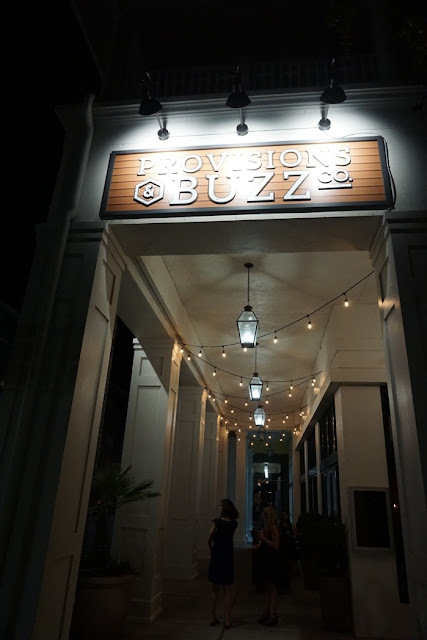 I was invited to the grand opening of Provisions & Buzz Co. This restaurant is located along New Broad Street in Baldwin Park and was formerly Jack's Steakhouse. The decor of Provisions & Buzz Co. seems to be loosely themed around bees. There were hexagonal honeycomb designs hanging on the walls of the restaurant. Bees appeared on the menu, jars of honey were given as parting gifts, and the obvious Buzz in the restaurant's name. Small, sample size bites of many of the menu items were served at the grand opening. The Tuna Tartare was one of my favorites. It was topped with avocado, pickled cucumbers, micro greens, wonton chips, and sweet soy. Crostini: The bread was a little too hard for my liking, but the tomato topping did have a very nice garlic flavor. Cheese Puffs: Lightly fried pillows, filled with fontina cheese and crispy pancetta. These were good. They resembled tater tots in size and appearance from the outside, but were filled with cheesy deliciousness inside. Pork Shank: Braised served over soft goat cheese polenta with roasted garlic and onion gravy. Caramelized Onion and Smoked Gouda Quesadillas: I liked the smokey flavor of the cheese in these quesadillas. Tempura Shrimp: Tempura fried then tossed with spicy honey aioli. I guess the honey aioli brought us back to the restaurant's bee theme. Zona Fresca is a new restaurant which has recently opened in Ravaudage near the intersection of Lee Road and 17-92. This fast-casual restaurant serves fresh, healthy, Baja-Style Mexican food. 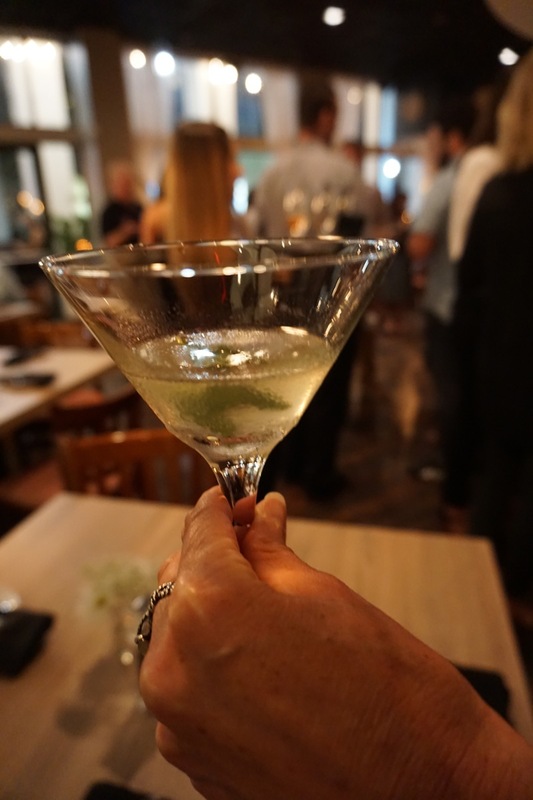 They are based out of South Florida and this is Zona Fresca's first Central Florida location. I was invited to give Zona Fresca a try, and I did enjoy what I sampled! I started out with the Pozole Soup. In all my experience eating in Mexican restaurants, I don't think I have ever ordered soup. This soup had braised chicken, hominy, onions, cilantro, and radishes in a guajillo chili broth. I very much enjoyed the soup, and may be my favorite dish out of everything I sampled at Zona Fresca. I had a sampling of tacos on the Three Street Taco Plate. I tried the Chicken Breast, Machaca, and Baja Fish tacos. Each was served on a double layer of corn tortillas. Of the three, the Chicken Breast taco was my favorite, exceeding my expectations. The chicken was topped with cactus, avocado, cilantro, onions, and a lemony dressing. With a meat that had the potential to be bland, the combinations of toppings on the chicken taco made it burst with flavor. The Machaca was my second favorite. I don't think I've ever ordered machaca at a Mexican restaurant before. This was slowly braised shredded beef, topped with poblanos, tomato, and queso fresco. It reminded me a bit of ropa vieja with the shredded beef being tender and flavorful. The Baja Fish Taco was my least favorite of the three. Nothing wrong with the taco, but the fried fish topped with cabbage, pico, and tangy dressing really didn't have anything that stood out. I also tried the Chili Rellenos. Two charbroiled poblano peppers stuffed with jack and cheddar cheese, served with black beans, cilantro rice, and pico de gallo. The peppers had a nice charred flavor and were very tasty. I had the Flan for dessert. Can't go wrong with custard-like desserts topped with honey.